Most of us want to conduct regular leader-development sessions with our subordinate leaders, but few of us manage to do so. Our good intentions are overwhelmed by the relentless demands of command. Before we know it, weeks or even months have passed since we last gathered our key leaders and engaged with them in meaningful professional conversation about being Army leaders. This is not a problem of motivation; it is a problem of resources. Too often, we lack the time or expertise to develop leader-development plans and materials. To assist our fellow commanders, the CompanyCommand Team recently launched an initiative to produce leader-development materials for company-level leaders. Called CCLPDs (Company Commanders’ Leader Professional Development), each downloadable, mobile-friendly module is designed to spark professional conversation. The ready-to-use materials for each CCLPD typically include a short video clip of a company-level officer sharing an experience, sometimes a short related article and always suggested discussion questions. We envision commanders taking 15–45 minutes once a week, perhaps before PT or around a lunch table, to develop their leaders using CCLPDs, which are available in the CompanyCommand forum. In this article, we share selections of materials from three of the CCLPDs, using edited transcriptions of the video clips. We invite you to make use of this article to conduct LPD sessions with your subordinate leaders. Please keep in mind that the following narratives come from real leaders describing their actual experiences in complex circumstances; do not expect to hear “school solutions” that have been staffed and sanitized. Instead, put yourself in their boots, reflect on the leadership challenges they describe, and gain a deeper understanding of those challenges by discussing them with your fellow professionals. “We’re driving into the Tangi Valley [in Afghanistan], and that road is an IED hotbox. Let me paint the picture. The road runs parallel to a river. To our right is a steep cliff face, to our left is the river, and then farmland, and then another high ground. What the enemy usually does is run a command wire across the green zone [farmland], over the river and up to the road. Because there aren’t many bridges, the river is an obstacle that makes it harder to catch the triggerman. So, we’re driving in and my lead truck hits an IED. Well, every time an IED happens, obviously, all the Afghan civilians in the area run away. There’s only one triggerman, but lots of people run away. Soldiers always want to … they would love nothing but … if I just said, you know, open up with the .50-cals, no one would bat an eye and everyone would just do it. “So, we hit an IED. My soldiers immediately traced the command wire to a spot, and they found a guy in the general area, but he didn’t have anything on him—no incriminating evidence. When I arrived at the scene to question the detainee, a soldier was yelling and acting aggressively, with the squad leader looking on. I grabbed both the squad leader and soldier by their IBA handles, pulled them back, and told them to get the hell away from there right now and go sit in the trucks. Then I called another squad leader to the scene so I could start my TQ. “The other day when I was hit by an IED, I was pissed off. It’s called being human. It’s human nature to want to get revenge on the people that are trying to kill you. You have to get control of that. – What comes to mind as you listen to these leaders’ experiences? – How do the intense emotions whipped up in war challenge a unit’s behavior? – Why is it important to act ethically, even in war and if no one’s watching? – What are some things leaders can do—before, during and after an operation—to foster ethical conduct by our soldiers? The shock, devastation, and anonymity of IED ambushes can generate anger and a desire for revenge. ‘You have to get control of that,’ says 1st Lt. Adam Herndon, who survived this 2007 attack. 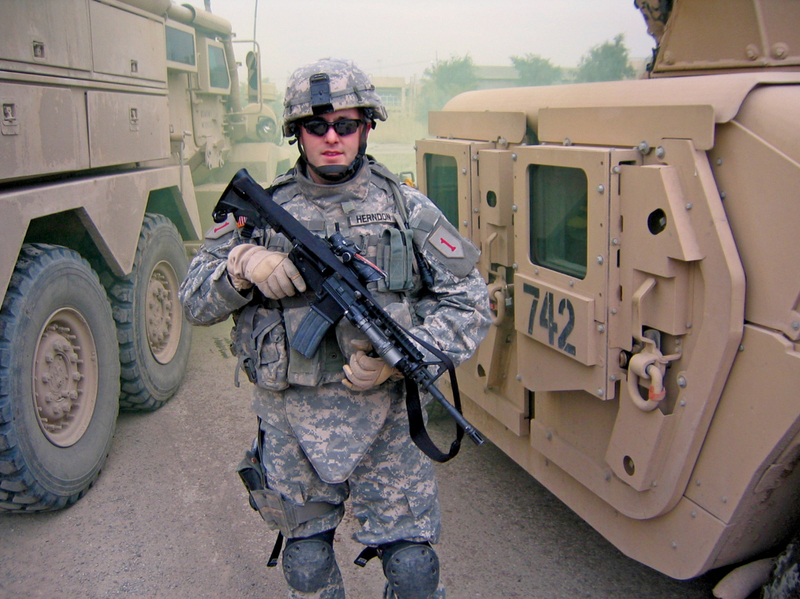 Herndon led daily patrols in Baghdad during his 2006–07 deployment. “On Day 3 in Baghdad, we got the bright idea to reinforce success and roll out on another raid deeper into enemy territory. It was probably 2 kilometers into an enemy-held part of the city. As my scout platoon neared the objective, we made contact with about a squad-sized element that was securing an enormous cache located in the courtyard to a school. The cache was probably as big as the parking lot that you see here, a couple hundred meters by about 50 meters. “We rolled in to secure the site and evaluate exactly what was in there and what it would take for us to blow it, if we wanted to blow it. We were cautious about chemical weapons and biological weapons being stored in there. We secured the cache, and as I got on the ground and was making my rounds, getting counts and identifying types of ammunition, the contact grew to about 30 personnel and just kept growing and growing and growing. “My initial request for indirect fire support was denied. I tried to get a ‘shake-and-bake’ mission with a high-explosive/white-phosphorus mix to blow up and burn the cache at the same time. Battalion said it was too close to the civilian population for that. They authorized me to blow the cache in place, said it was my discretion. So we went ahead and rigged up demolition charges. “As I was inside the cache, the enemy fired an RPG. It detonated next to me and started cooking off ammo. So I was in that courtyard with ammo cooking off all around. I had four or five charges set out there, and none of them had been initiated yet. So as I bounded back to the Bradleys, I popped the time fuses on each of those charges. That was one of the moments when I thought I was going to die, but thankfully didn’t. “A soldier’s ability to turn it on and off is just amazing to see. I’ve seen it so many times. A soldier smokes a bad guy 100 meters down the road, and at the same time he’s picking up a baby and throwing it in a car and pushing a family aside, all as he’s out there putting himself in front of those who are shooting at them. His ability to turn it on and off is just unreal. – What are some factors that should be considered when there is an apparent trade-off between the risk to accomplishing the mission and the risk to protecting noncombatants? – How much risk do you personally accept, and how much will you require or allow your soldiers to accept, in order to minimize the risk to civilians on the battlefield? – 1st Lt. B’s situation occurred during the 2003 attack into Baghdad; Capt. Ferris’ situation occurred during the 2007 surge in counterinsurgency operations. To what extent should the nature of the conflict (along the spectrum of conflict) impact the way we manage risks to civilians? 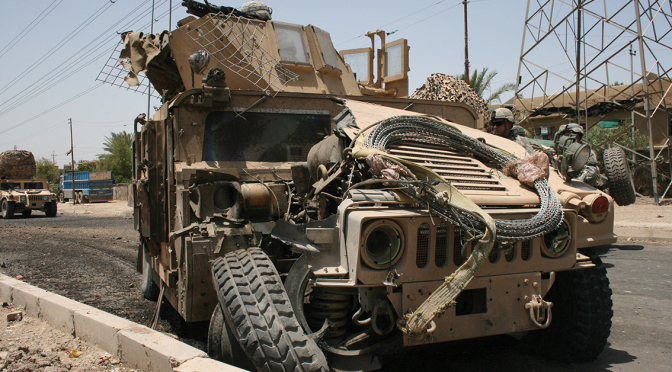 “My company’s QRF had gotten activated to take a wrecker out to an IED site. We had done that mission several times, so I didn’t think anything of it. I was preparing for an upcoming operation when I received word that I needed to report to the battalion TOC with my first sergeant. I had no idea what we were going there for. As soon as we opened up the door to the TOC, I knew something was up because there were about 80 people in there. The ISR screen was up, showing some trucks, but I didn’t see exactly what was going on. I walked forward to see the S-1, who was actually standing at the door waiting for me. He was holding one of my trip tickets. “I replied, ‘That’s not possible because we support AO Strike, and Zormat is in a different AO. So go back and reconfirm.’ So he reconfirmed, and I made him reconfirm four times before I accepted the fact that I had lost a squad leader, two soldiers and an interpreter in one catastrophic IED. “When first sergeant and I finally determined that those four soldiers—well, three soldiers and the interpreter—were actually deceased, we had to go tell the soldiers. It was just before lunch. First sergeant put out an order to the company: ‘Turn off your NIPRs [Internet connections], turn off your computers.’ He didn’t tell them why; he just made them turn them off. We have enough discipline in the company that they don’t need to know why; they just execute. And then first sergeant called up the NCOs and told them to have all the soldiers go immediately to chow—no questions, no reasons why—but he wanted them to eat before we told them what had happened. Then first sergeant and I left the TOC to compose ourselves before we talked to the company. “After chow, all the soldiers assembled in the chapel, with the chaplain and combat stress team also present. First sergeant started trying to tell our soldiers what had happened, and he got as far as, ‘I called you all in here today …’ and then he couldn’t say anything more. So I finished it. It wasn’t graceful; I was crying as I spoke, but I had to explain to them that we had lost a truck. And the soldiers were the same way I was. They looked at me and were like, ‘OK, why are you calling us in for a truck?’ Then I said, ‘and all its occupants,’ and you saw them all freeze—everybody was hoping it wasn’t their soldiers. Then I started listing the names of the soldiers that we had lost. “One of the soldiers ran out of the chapel. I stopped and made soldiers in his platoon go and bring him back in. And then I made the ground rule that nobody was allowed to be by themselves for the next 24 hours. These were our first casualties. A lot of my soldiers are young, right out of high school. They tend to catastrophize, so you have to watch them for suicidal thoughts right after you break some bad news like this. I told them that it didn’t matter if they talked to each other, if they talked to the chaplain or to ‘combat stress’ or anybody else, or if they just sat in silence together, but for the next 24 hours, they had to be buddy-teamed. That way they had some kind of tie, some kind of accountability to make certain that if one of them started having bad thoughts of suicide or something like that, they would go get help. – What are some things leaders can do to prepare their units to respond resiliently to the shock of suffering casualties? – What are some things that Capt. Doak did that you’d want to do in similar circumstances? – What are your personal experiences with death? How might they influence how you respond to a death in your unit? Leaders come and go; their enduring legacy is the leaders they develop along the way. Command is a privilege that entails the awesome responsibility to develop the next generation of Army leaders. CCLPDs can be one tool in your leader-development kitbag. We also recommend the video case studies at http://cape.army.mil/case-studies/. Company commanders: Share your own stories and learn from your peers’ experiences in the CompanyCommand professional forum: http://CC.army.mil. Follow us on Twitter:@CoCmd.